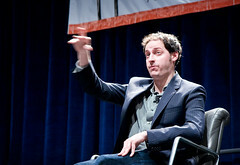 Nate Silver Gesturing Wildly. Actually, Just a Slow Shutter Speed., a photo by handcoding on Flickr. Nate Silver, the award-winning statistician who shot to fame when he correctly predicted the outcome of all 50 states in the 2012 US presidential elections, says all the indicators point towards Scots voting to stay in the UK on 18 September next year. True, although some recent polls have been very close (37% Yes vs. 46% No in the Panelbase poll for the Sunday Times in July, and 34% Yes vs. 36% No in the indirect question asked by Panelbase for Wings over Scotland), and although the gap has been closing slowly. Only a “major crisis” south of the Border could turn the situation in favour of independence, despite it being more than a year until polling day, he added. If the Panelbase polls are correct, only 0.5% of Scots need to shift from No to Yes every month for the Yes side to win. That’s clearly possible without any major crisis (we’ve seen much bigger shifts than that in electoral campaigns lasting less than a month). In an interview with The Scotsman, Mr Silver said polling data was “pretty definitive”. “There’s virtually no chance that the Yes side will win”, he said. “If you look at the polls, it’s pretty definitive really where the No side is at 60-55 per cent and Yes side is about 40 or so. I don’t know about you, but it looks to me like Nate Silver is for some reason completely ignoring the Panelbase polls in order to reach his conclusion here. “Historically, in any Yes or No vote in a referendum, it’s actually the No side that tends to grow over time, people tend not to default to changing the status quo. Really? Let me quote from the Wikipedia article about Quebec’s 1995 referendum: Early polls indicated that 67% of Quebecers would vote “No”, and for the first few weeks, the sovereigntist campaign led by Parizeau made little headway. […] Under Bouchard, the numbers continued to change; new polls eventually showed a majority of Quebecers intending to vote “Yes”. […] Days before the referendum, it appeared as if the sovereigntists would win. As noted on SCOT goes POP!, there are several examples of independence referendum campaigns developing like this. He offers this explanation: My guess is that, paradoxically, the more important a referendum is, the less likely voters are to swing to No by default. The supposed tendency that Silver talks about is largely a side-effect of electorates so often being faced with relatively trivial matters in plebiscites. Really? Panelbase’s July poll had 48% Yes vs. 52% No for 18–34 year olds (after excluding the Don’t Knows), 50% Yes vs. 50% No for 35–54 year olds, and 36% Yes vs. 64% No for 55– year olds. Most polls I’ve seen have confirmed this: The youngest voters are slightly more sceptical than those in their 30s and 40s, but the oldest voters are the ones most likely to vote No. Speaking yesterday, Mr Silver said, however, that the Yes campaign could benefit if there is some kind of dramatic economic collapse south of the Border. “If there was a major crisis in England – if the Eurozone split apart and there were ramifications economically (for the UK) – the maybe things would reconsidered a little bit. Perhaps. There’s also a strand of thought that people are more likely to vote for independence if they feel positive and optimistic about the future. This is a rather bold conclusion, given the figures I quoted above. The French-speaking province of Quebec in Canada has previously rejected a vote on independence, despite sharp “cultural differences and genuine hostility” with the wider Canadian state, Mr Silver added. I’m not sure what he’s trying to conclude here. Surely he doesn’t believe you can only win an independence referendum if there’s sufficient “cultural differences and genuine hostility”? “That is a case where a smaller country reads more about the economic consequences and it becomes harder to change the status quo. As far as I’m aware, the Quebec referendums failed because they didn’t manage to convince the Anglophones they wouldn’t be discriminated against in a French-speaking country, not because they read about the economic consequences. “That was one where the Yes vote had been ahead, then faded down the stretch and lost. The Yes vote was well ahead until two weeks before polling day, and in the end the result was 50.58% No vs. 49.42% “Yes”. I don’t think that’s called “fading down the stretch”, it’s called “losing the final sprint”. Michael Hance liked this on Facebook. I thought it was the No vote that was well ahead until shortly before polling. Am I mistaken, r was that a typo? The No side were originally ahead, but Yes overtook them and were leading the race until a few days before the actual vote when the No side managed to overtake them in the final heat. And by the way, great article. Sorry, forgot to put that bit in, I really mean it. I like the analysis, but can I suggest you call it an analysis rather than ‘Fisking’? As you may know, the term comes from rightwing criticism of the journalist Robert Fisk, who has done much to cover illegal wars, human rights abuses and the struggles of oppressed people. I’m aware of the origin of the word, but I reckon the word has taken on a life of its own. I use it in the sense of “a point-by-point refutation of a blog entry or (especially) news story”, as defined by the Jargon File (and quoted by Wikipedia). The received wisdom that the YES sovereignists were ahead in the polls in Quebec is wrong – the YES campaign was behind in the polls and only picked up significantly in the last few weeks.